Onkyo CS-255DAB mini hi-fi includes Lightning dock | What Hi-Fi? 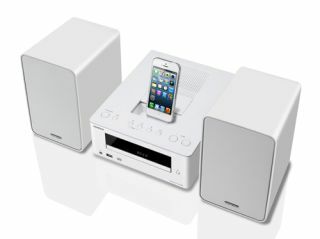 Onkyo's new CS-255DAB mini hi-fi system will not only dock and charge the iPhone 5, but can also handle legacy iPhone/iPod models – as well as audio playback from compatible smartphones and tablets – via USB. The integrated dock includes a Lightning connector for the iPhone 5, iPod Touch (5th gen) and iPod nano (7th gen). There's also a stereo 3.5mm input for devices that can't use the USB connection. A DAB/DAB+ tuner with 40 memory presets is fitted as standard, along with a 30-preset FM tuner, front-loading CD player, digital amp and a pair of two-way speakers. All for £250. The speaker cabinets feature a 10cm cone driver, 20mm balanced-dome tweeter and a cabinet with non-parallel sides and rolled edges to prevent internal standing waves, which can hinder performance. A selectable two-mode Super Bass function is intended to prevent the "muffled boominess" typical of small audio systems, says Onkyo. The Onkyo CS-255DAB will be available in a white finish from July.